Juventus Lyrica closed a grat year with a proposal full of finds. In the version offered by Juventus Lyrica, acclaimed soprano Soledad de la Rosa was an exquisite singer from the vocal point of view of the complex character of Violeta, that implies facing in every act different dramaticccc characters in a succession that goes from triviality (agility soprano) to dramatic (spinto soprano). On the other hand, with the sincerity and honesty that distinguishes her, displayed the beauty of her voice and the infallibility of her tuning, gift that comes from her perfect pitch. Ina new production of Juventus Lyrica, the sopano Soledad de la Rosa composed a memorable Violeta, within a high general level of the acting. Soledad de la Rosa has a notable technical control, not only for the naturalness with which she solves the passages of coloratura, but for the perfect subordination of the colour and volume of her voice to the spirit of the character, receiving a closed ovation to her talent. This splendid operetta is sung by a vast cast. Soledad de la Rosa composes a Hanna Glawari with solid musicality and very good voice, long and harmonized. Soprano Soledad de la Rosa finds the accurate tone for Hanna, the widow at marriagable age, with her deep voice and strict manner, but with no lack of craftiness. It is touching to realize the naturalness with which she goes on from the word to the singing and from the march to the dance. Her feet take off gracefully of the floor and her body lightens in the scene of waltz. "La Nacion" Journal – Buenos Aires. The positive point of the version was given by the soprano Maria Soledad de la Rosa, who played the role of Antonia last Sunday. Happy circumstance to value, so forceful, her exquisite musicality and exceptional condition of her voice. In our opinion, de la Rosa passes the summit of her art with the added distinction that assures her a rank among the most notable opera singers in the country, that statement is based on its strengths: striking volume, beauty tone, unerring pitch, phrasing captivating and intelligent acting ability. And how could it be otherwise, the public tribute is the greatest ovation. Among the participants in "Acis and Galatea," the work of Soledad de la Rosa with a delicate issue excelled lyrical vocal line and a central register, impeccably sustained. The consecrated soprano Soledad de la Rosa reiterated her exquisite musicality, with that angelic tone captivating and invariably causing pleasure to the audience. The soprano Soledad de la Rosa wore his customary musicality, pleasing color, voice, stop perceiving each aria ( "d Visi art" and "In Quelle Trine morbide") shades of a singer of great sensitivity, which causes immediate pleasure of hearing. Soledad de la Rosa was exquisite in all its interventions. Ninth Symphony in D minor Op 125 ( "Choral") Beethoven. At the Gran Rex theater. of the arias, while crystal-clear sound and pitch. Soledad de la Rosa left a blunt and listen to their unquestionable beautiful voice, which caused auditory pleasure for its crystalline color, sure intonation and range of inflections and nuances. Furthermore, her expression of poise and confidence in her ability transformed her performance in a real master class in operatic singing. Since the aria "Par che Nasca in seno," the opera Tamerlano shows the basic factors of good singing, the perfect articulation of the words without resenting the line of phrasing, clarity, rhythmic precision to resolve with the resolution of motifs characteristic of Baroque-style approach involving detailed passages of agility without losing expressiveness, inter alia revealed that the tremendous wealth of resources at the highest level of expertise that Soledad de la Rosa has. Was also able Soledad de la Rosa, an impact worthy of a celebration of admiration when she offered by heart one of the author's most inspired moments, the aria "Piangerò la sorte mia", which alternates with other parties slow on the fast and bright Coloratura, either committed here, incidentally. This is a summit that remarkable title that is Händel Giulio Cesare in Egitto, perhaps one of the most widespread of the gallery of the author's German operas. The song of the artist led a happy reaction from the public. Then a moment of instrumental and a great demonstration of skill and strength, added to the closing "Da Tempeste il legno infranto," the same opera, which generated a sustained applause for the aggregate time of one aria Scipione which was heard in the first part. Sober and sensible to end a day of great music that will remain in the memory. The Motet K.165 "Exsultate, jubilate," a concerto for soprano soloist, that the singer Soledad de la Rosa undertook to secure intonation and flexibility of interpretation. By temperament and empathy with the admirable style, De la Rosa reported without apparent difficulty or effort the boundless joy that pervades the movement of this work ends with a flow and a very good vocal projection regulated in elegiac Andante ("Your virginum corona), and with the support of a very well run Camerata, sang the Alleluia with its dizzying heights and delicate coloratura with a joyful spirit. On stage was highlighted mainly the soprano Soledad de la Rosa, whose recording of light-lyrical arias of the printed Konstanze, specially “Marten allen Arten” an appealing musicality, great phrasing and impeccable coloratura notes issued. Deservedly won for her work the warmest expressions of the public. The joy was reflected in her face, the poise to deliver naturally crystalline voice and her formidable ability to sing with a rich nuances of phrasing, delicate and subtle sounds from up passages captivating presence were some of the virtues that made the listening soprano Soledad de la Rosa to incarnate to Constance, in the version of "Die Entfürung aus dem Serail" by Mozart, hosted at the Teatro Roma de Avellaneda. But her success was not only safe passages sang with ornaments or for having shown to have a large registration, when arriving at the most acute effortless, but is based on her innate musicality, that gift that is not acquired but part of those who are chosen by nature to be singers. Soledad de la Rosa wore her captivating tone and thoughtful attitude to achieve a volume content. "Clarín" Journal – Buenos Aires. Monteverdi's opera, with good performers, among whom Soledad de la Rosa. Soledad de la Rosa was the great figure of the night, as Drusilla, although the soprano imposed the difference from the Prologue, as Virtù. "L incoronazione di Poppea" by Claudio Monteverdi. Undoubtless to say, Soledad de la Rosa is, a soprano capable of safely and with solvency music and baroque an innocent girl like any character in the classic Verismo or more passionate. Without excessive vibratos and stripped of unnecessary volumes to her voice she built the character of Drusilla, poignantly in her simplicity and candor, without forgetting that in the “Prologue”, she filled the Teatro Avenida of music to embody the Virtù. To caress the ears: Soledad de la Rosa came to ratify the merits which were evident with successful interventions in the field of opera and concerts. A singer who leads the public to a caress hearing. Shostakovich: Symphony No. 14, op. 135. Auditorio de Belgrano..
Soledad de la Rosa, once again impressed with her expressive voice, full of nuances and brilland through all her register. “Clarin” Journal – Buenos Aires. 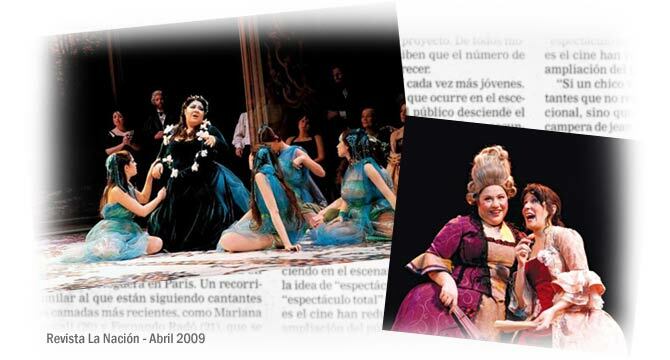 "The Tales of Hoffmann" included in its premiere, with the admirable soprano Soledad de la Rosa. Juventus Lyrica just introduced “The Tales of Hoffmann” at the Teatro Avenida, in the traditional edition Choudens, collecting also the main challenge posed by the interpretation of the work: the three female roles, the automaton Olympia, the sensuous Giulietta, The innocent Antonia are embodied by the same soprano, in this case, Soledad de la Rosa, admirable in terms of voice and acting. "La Prensa" Journal - Buenos Aires. In a very hard task, since she took four different roles (Olympia, Giuliet, Antonia and Stella) which is unusual anywhere in the world, the soprano María Soledad de la Rosa sung with freshness and passion, specially in the last act, where beside the virtuossity of the doll, her phrasing and her musical expressivity was brilland indeed. "La Nacion" Journal - Buenos Aires. One of the outstanding Rosa recreated the essence of each of the female incarnations: as a soprano, coloratura in the doll Olympia (exceptional in addressing highest register, in "Les oiseaux dans la Charmille") or greater lyrics requirements as Giulietta, with a dense melodic line, in a successful second act in which the famous footprint charming Barcarola, an emblematic part of the opera. A Venetian gondola reinforced the suggestive atmosphere of fantasy of the opera. Antonia, the delicate lyric soprano, was also expressive accents. "La Prensa" Journal – Buenos Aires. Soledad de la Rosa, who offered a version of Mozart motet "Exultate, Jubilate" exquisite vocal style and wore a metal excellent color matching and warm, crystal projection reverberations eloquent and easy. "La Nación" Journal – Costa Rica. "La Traviata" by Giuseppe Verdi.. The beautiful, powerful and well-modulated voice of the argentinian soprano Soledad de la Rosa, at her debut in Costa Rica, most of the audience that filled the theater, agreed to the singer in the character of Violetta, the protagonist, a beautiful Parisian courtesan.